[Limited Edition] R2-Q5 comes with a special Industrial Automaton Astromech Droid collector's coin ! Kotobukiya's line of ARTFX+ Statues based on Star Wars characters continues with R2-Q5 ! Beautifully sculpted in 1/10th scale, this black and bronze R2 unit in service to the Empire makes for a sharp contrast with the rebellion's R2-D2.Additional parts allow for posing on either upright on two legs or inclined on all three legs, with magnets in the feet for extra stability on the included base. This limited edition* R2-Q5 comes with a special Industrial Automaton Astromech Droid collector's coin ! 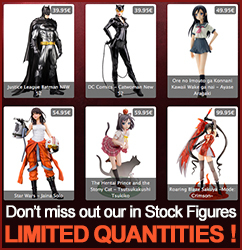 Display alone or alongside other ARTFX+ Star Wars character statues from Kotobukiya ! *Limited quantity: Shared quantity with all Kotobukiya websites, earlier orders will be earlier served. We can not assure the product availability. Deposit will be refund in case of non-availability. End of Preorder : Sold out.